If you are a little disappointed summer has come to an end, we’ve got something that might get you excited: Oktoberfest. Despite the name, Oktoberfest actually begins in the third week of September. While festivities obviously include having some brew from Hofbräuhaus München, Spaten-Franziskaner-Bräu, Paulaner Bräu, Löwenbräu, Hacker-Pschorr Bräu, and Augustiner Bräu, Oktoberfest is also a massive 16-day fair which includes everything from competitions to consuming local favorites like Weisswurst, Brez’n, or Obatzda. 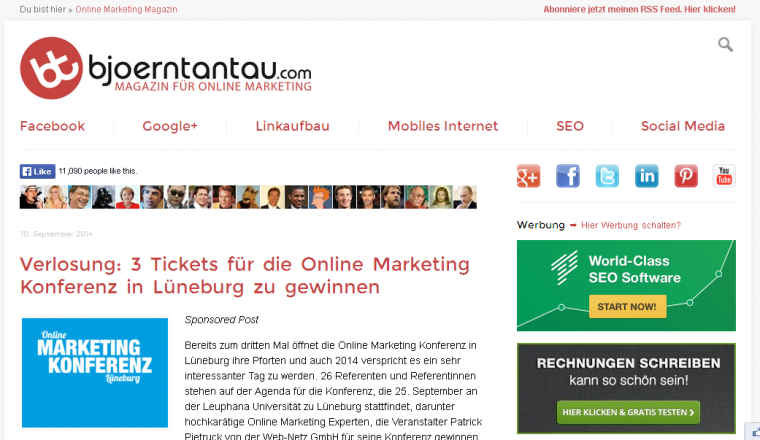 Since we have Oktoberfest on our minds, it just made sense to highlight the top SEO and online marketing blogs from Germany this month. It turns out content marketing is important for German companies. In fact, it appears to be on the rise. 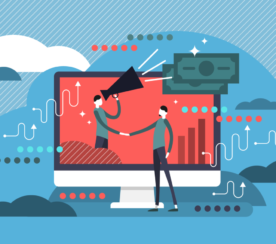 According to a study from HORIZONT (a German online media platform), in 2013, 43 percent of marketers planned to increase their content-marketing budget, and another 50 percent were considering an increase in the budget. Even more interesting was how marketers viewed content marketing. 58% believe content marketing is a new communication channel that focuses on the exchange of information between a brand and its target group. 40% think content marketing should focus on quality content and the creative communication of this content. 35% stated content marketing is conveying information to the target audience via social media channels. 18% believe content marketing is a strategy to attract customers. Germany may not be as well-known as English-speaking countries in regards to content marketing, but that could all change very soon. 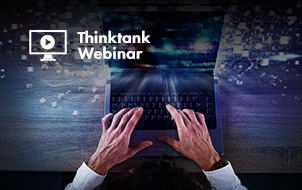 German marketers are realizing its importance and are completely embracing the tactic. 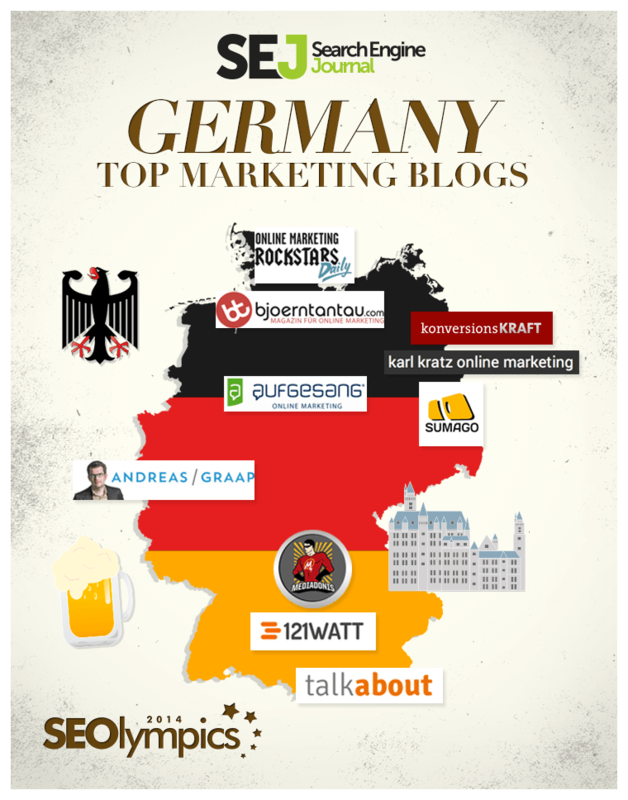 To prove that point, we wanted to share the top marketer blogs in Germany. 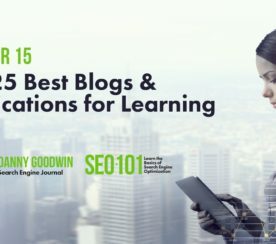 As always, we selected the blogs based on a subjective criteria like voice, content strategy, and quality. If we forget to include a blog you feel is worthy, please feel free to add your suggestion in the comment section below. Finally, the following list is in no particular order. For a good percentage of the SEO community, Marcus Tandler needs no introduction. 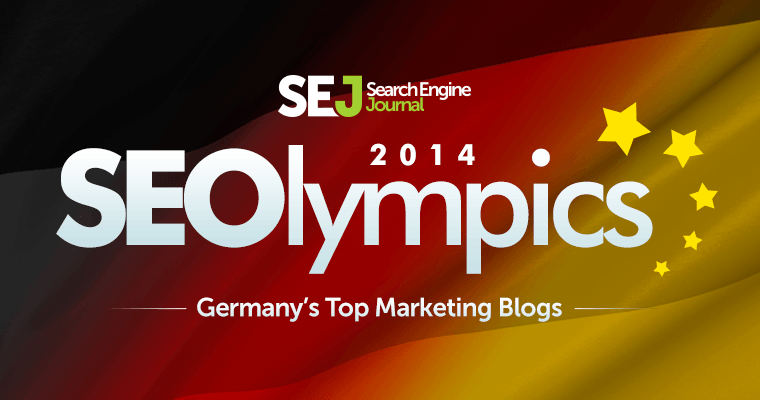 He began working with SEO back in 1998, prior to Google’s arrival in Germany. Since then Mr. Tandler has built an incredible resume. He co-founded one of Germany’s most innovative companies OnPage.org, hosts the SEO think tank event SEOktoberfest, and has spoken at global events like TEDx, LeWeb, The Next Web, Search Engine Strategies, SMX, and O’Reilly’s web2.0expo. 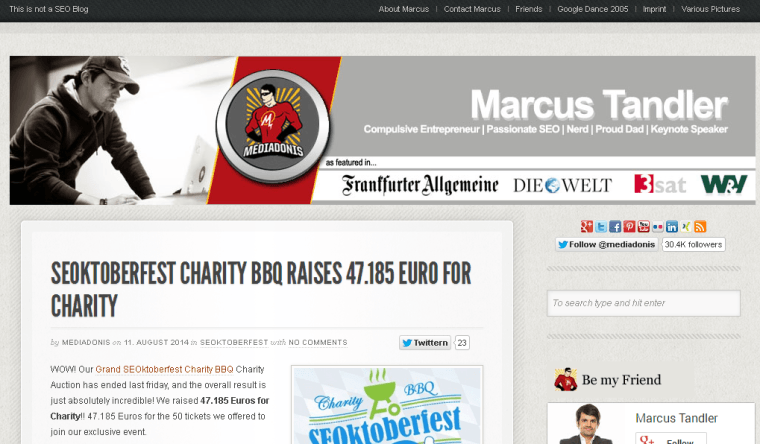 He also runs his own blog Mediadonis, which does an excellent job of pulling together the global SEO community by promoting charity events like the SEOktoberfest charity. The blog also features interviews with industry leaders and even has guest posts from Dr. Marc Laukemann. This is one of the more unique features we’ve seen on a marketing blog, since Dr. Laukemann is a lawyer with over 15 years experience in online marketing. 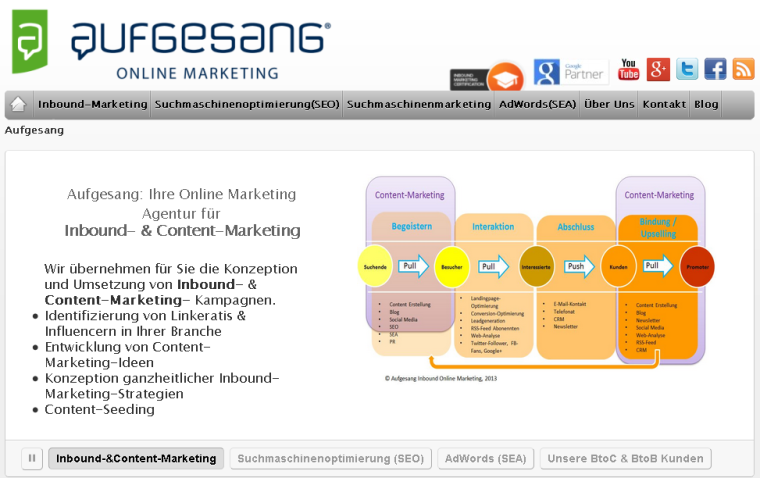 Managing the Aufgesang Inbound Online Marketing Group, which specializes in inbound marketing, Google AdWords, SEO and Web Analytics, is Olaf Kopp. 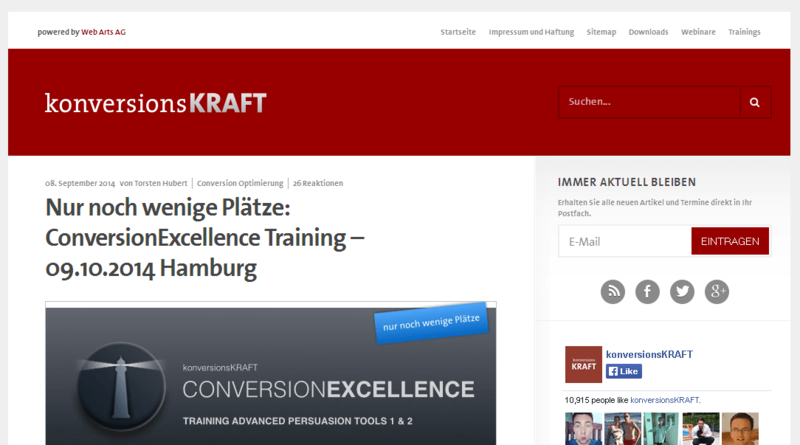 Kopp has been involved with SEO and AdWords since 2005, is the author of the e-book “AdWords-Optimierung” and is one of the organizers of the SEAcamps. 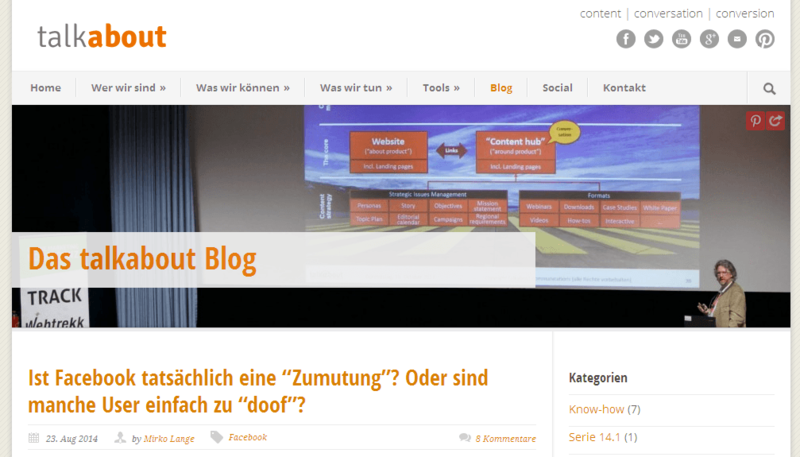 Since 2012, the Aufgesang Inbound Online Marketing blog has written hundreds of articles focusing on SEO, inbound marketing, AdWords, content marketing, and social media marketing. The blog features thought-provoking guest posts from some of Germany’s most respected industry leaders. One of our favorite articles written by Mr. Olaf explains exactly what content marketing is and why it doesn’t make sense to use it for SEO purposes. What makes the articles stand out are the videos used to break up content. See “Good content. Substance, the throb,” as an example. While the blog posts mainly focus on content marketing, Mr. Kratz also discusses other topics – such as a guest post that dealt with the Legality of Web Tracking Tools. SUMAGO was founded in 2004 by Marco Janck. 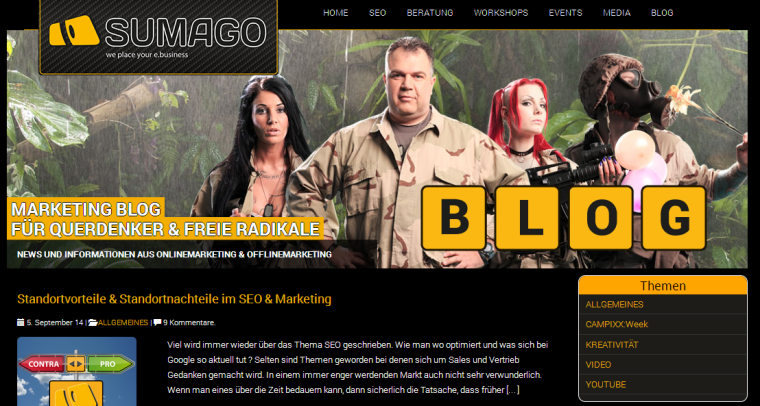 Marco is another trusted leading SEO expert in Germany who has been involved with SEO Blog SEOnauten, the podcast Radio4SEO, and SEO Campixx. 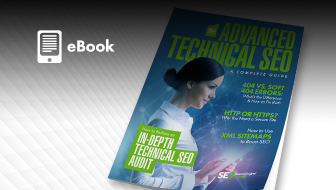 By 2011, Marco got “bored” so he brought in a SEO all-star team that consists of Stefan Rudolph, Amira Hussein, and Amy Herzstark. The SUMAGO blog does a solid job of balancing SEO and content marketing with articles like Google and the Link Networks. There are also workshops and consulting for all of your online marketing needs. We also kinda like the unique motif of the site, which is a military inspired but features flowers coming out the weapons. Conversion Force primarily focuses on conversion optimization and landing pages . However, the blog also provides useful facts, figures, and checklists you can use to enhance your conversion rates. Conversion Force also features breaking industry news, webinars, and downloadable content like ebooks and infographics. Conversion Force is run by Web Arts AG, Germany’s leading agency for conversation optimization. This innovative company’s senior consultant is Andre Morys – author of “Conversion Optimization” and organizer of the Conversion and Conversion Summit Camp. Bjoern Tantau has been working with social media, SEO, link building, and online marketing for over 14 years. He’s also the Senior Manager of Inbound Marketing at TESTROOM GmbH, has written a book about Google+, and spoken at leading industry events. Mr. Tantau’s blog features educational tips and the latest news to help boost your content marketing efforts – such as 12 tips to guarantee success with Facebook marketing. However, since Mr. Tantau has experience in many areas, there are also posts about SEO, social media, affiliate marketing, landing page optimization, and website building. 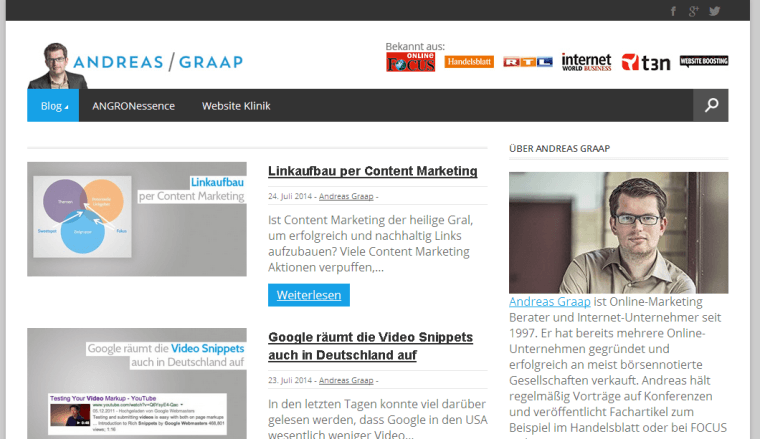 The Angron blog is run by Andreas Graap, who has been an entrepreneur and online marketing consultant since 1997. Mr. Graap has launched several successful online businesses, is a speaker at leading industry events, and author of free ebooks like the Inbound Marketing Guide. 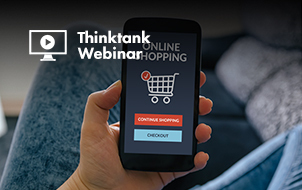 Besides keeping up with the latest updates and news, Mr. Graap also provides intriguing articles such as Link Building by Content Marketing and How to Transform Visitors into Buyers. 121Watt was founded by Alexander Holl in 2008. Mr. Holl, who was formerly the Director at AltaVista and Yahoo and Managing Director of kalaydo.de, has used his expertise to create a consulting agency aimed at helping others understand and improve content marketing campaigns. While 121Watt has a strong conference and social media presence, their blog is also extremely useful. 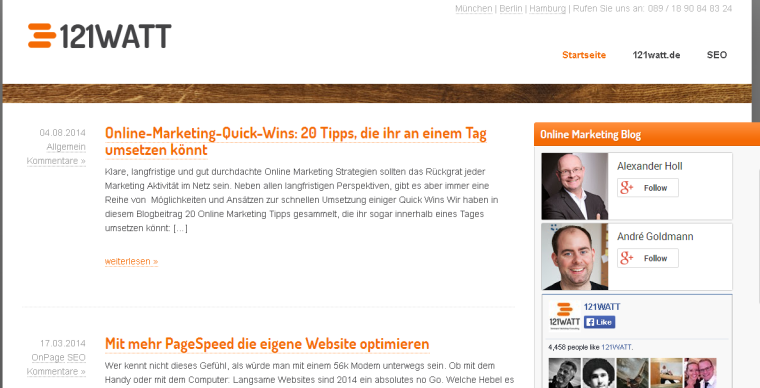 For example, the blog has an article on 20 tips to implement content marketing. Other topics include everything from SEO, social media, conversion optimization, and web analytics. On top of the blog, 121Watt also provides seminars, marketing tools, white papers, and ebooks. The Online Marketing Rockstars blog might keep up with trends more so than their peers – we haven’t seen many other blogs interview 13-18 year olds to find out what the next big thing is going to be. Also, we’re fans of their “One Post Per Day” promise.That may not sound exactly impressive, but it seems like a difficult promise to follow through on when you’re busy consulting. Daily topics also include interviews with some impressive industry figures – like the general manager of Reddit. There’s also a pretty neat Bitcoin widget on the right sidebar that tracks the value of the brand’s Bitcoin value. 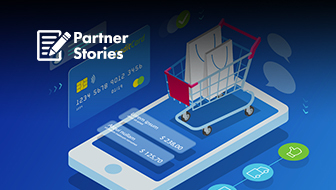 Founded by Mirko Lange, a lawyer and PR specialist with over 20 years of experience, the Talkabout Blog focuses on helping clients create amazing content, start a conversation, and then convert. By using his knowledge and experience, Mr. Lange is able to successfully convey his point with articles that go against the grain of typical content marketing articles – check out Social Media is mainly strategy – not dialogue as an example. 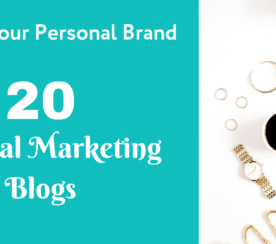 Other popular blog posts focus on social media monitoring and strategic content marketing – from not only Mirko Lange but also from a team of specialists who bring their past experiences and knowledge to the blog. Besides informative articles, the Talkabout Blog also includes infographics, marketing tools, and training sessions. 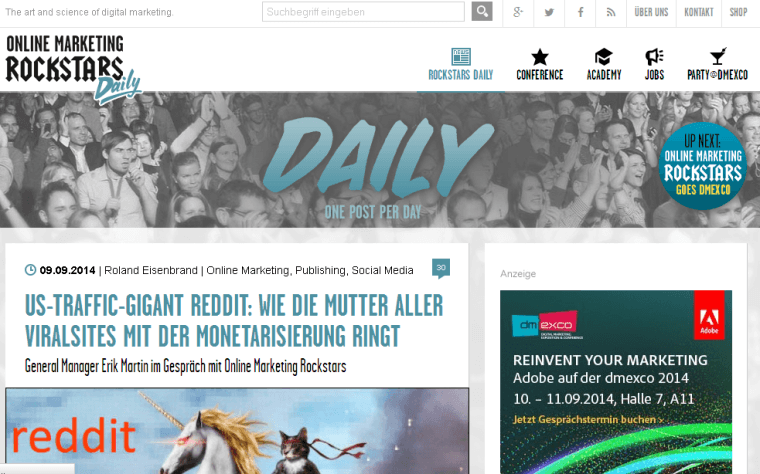 There was our list of the best marketer blogs in Germany! Did we get it right? Or did we miss a couple? If so, please share your favorite German blogs in the comments.